On February 18, 1942, the Japanese Imperial Army began a carefully planned massacre of ethnic Chinese men in the conquered territories of Singapore and Malaya, an effort to eliminate what the Japanese perceived to be “hostile elements.” As many as 100,000 Chinese men were executed in a purge called Sook Ching by the Chinese. Soldiers carrying out the deadly deeds were supervised by the Kempeitai, the Japanese secret police. 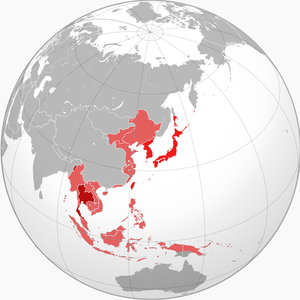 Members of the Greater East Asia Co-Prosperity Sphere; territory controlled at maximum height. Japan and its allies in dark red; occupied territories/client states in lighter red. Korea and Taiwan were integral parts of Japan. Map by Kendrikdirksen. Chinese identified in the following ways were targeted by the Japanese death squads, those being born in China and having moved to Singapore, suspected communists, wealthy Chinese that had donated to Chinese causes, men with tattoos (believed to be gangsters), civil servants, those that served with the Singapore defense forces, members of any party or movement perceived as anti-Japanese and those that owned weapons. Other “suspicious” Chinese included journalists, teachers, any sort of intellectual and those that had served the British. The Japanese had 200 secret police supervising about 1000 soldiers in gathering up the ethnic Chinese men and taking them to a prison camp for screening. Mostly Chinese men between 18 years old and 50 years old were “screened,” but there were exceptions, with some older and younger victims chosen. Some victims deemed anti-Japanese were identified as such merely on the whim of the ranking Japanese officer at each camp. Most of those Chinese males identified in any of the suspicious groups were executed, though a minority were merely imprisoned. Colonel Masanobu Tsuji, the primary mastermind for the Sook Ching operation in Singapore and Malaya in 1942. Funny how totalitarian states love their bureaucracy, in this case evidence by the practice of marking each Chinese to be released with an ink stamp of a square and those chosen for execution stamped with a triangle. The unfortunate triangle marked Chinese were rounded up and shipped to execution camps, one of at least 11 sites where the victims were mostly executed by being shot. When Singapore was liberated, mass graves were found at each of these killing sites. In Malaya, the Japanese lacked sufficient manpower and resources to conduct the sort of systematic screening as performed in Singapore, so the manner of “purging” dangerous ethnic Chinese was to kill as many Chinese males as could be found, resulting in tens of thousands of Chinese being murdered by marauding Japanese troops. After the War it was payback time, and the Allies conducted war crimes trials for the Japanese officers involved. While the main perpetrator had escaped to China, 7 of his underlings were tried, with 2 given the death sentence and the other 5 given life in prison. One of those 5 was later executed for a separate war crime conviction. The commanding officer that had escaped, Masanobu Tsuji, is believed to have died in Laos in 1961. The general that gave the orders for the massacre to take place, Tomoyuki Yamashita, was convicted of other war crimes in the Philippines and was executed in 1946. Other officers that had been in on the planning of the operation were later captured by the Soviets but not tried. In the typical unrepentant Japanese fashion, the Japanese government later admitted the massacre took place, but rejected demands by Singapore that reparations be paid to surviving family members of victims, and further claimed only about 5000 people were murdered in the operation. When Singapore became an independent country, its first Prime Minister gave his official estimate of 70,000 victims killed, while scholars vary between 50,000 and 100,000 Chinese killed. Japan finally did agree to make reparations payment in 1966, a pathetic $50 million and to make matters worse, refused to issue an apology for the heinous act. A memorial gallery containing images as remembered by witnesses and survivors is located at the old Ford Motor Factory at Bukit Timah in Singapore, the location where the British surrendered to the invading Japanese in 1942. The Sook Ching Centre site memorial stands at Hong Lim Complex in Chinatown. Photograph by Terence Ong. Questions for Students (and others): In light of this and other Japanese atrocities during World War II, do you think the use of atom bombs on Hiroshima and Nagasaki was justified? What other horrific Japanese atrocities against Chinese do you know of? Kratoska, Paul. The Japanese Occupation of Malaya and Singapore, 1941-45: A Social and Economic History. National University of Singapore Press, 2018. Modder, Ralph. The Singapore Chinese Massacre. Horizon Books, 2004. Yoshimura, Mako. New Perspectives of the Japanese Occupation of Malaya and Singapore, 1941-45. Singapore University Press, 2008. The featured image in this article, a photograph by Terence Ong of Sook Ching Centre site, is licensed under the Creative Commons Attribution-Share Alike 3.0 Unported license.